The Canadian Government has invested $20.7 million (CAD) to improve rail safety for both the Canadian rail workforce and its passengers. In August, member of parliament for South Ottawa, David McGuinty, on behalf of Marc Garneau, the Canadian Minister for Transport, announced 105 new projects and initiatives to improve rail safety at grade crossings and along rail lines. The ultimate goal is to improve the railways using innovative technologies, which will, as a result, increase public confidence in Canada’s transportation system. Two rail safety education awareness initiatives focused on reducing injuries and fatalities in communities across Canada. 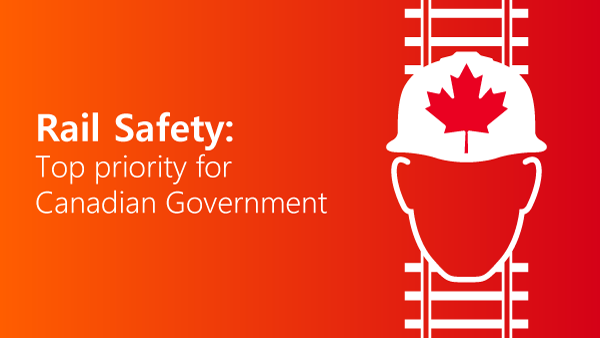 This announcement, and indeed, the program, forms an essential part of the government of Canada’s continued commitment to improving rail safety. Could the Canadian railways take inspiration from the UK railways? Covering over 40,000 kilometres of track, the rail system forms a vital part of the Canadian transport system. Like the UK railways, the Canadian railway system is one of the safest in the world. The adoption of new technologies – like what we have seen here in the UK – will see vast improvements to the country’s approach to rail safety. Digitising rail safety processes should be a massive focus for the Canadian railways’ safety improvement program. For our customers here in the UK, the benefits of digitising rail safety procedures has been transformative for the industry. Not only has the digitisation of close call and incident reporting apps encouraged a transformative improvement in discourse and management of safety on the railways, our very own RailHub platform has been awarded a Safety Integrity Level 4 (SIL-4) and has been implemented as a core element of our partners’ Siemens Operations Improvement Programme. By harnessing the power of the smartphone, the Canadian railways can begin to see massive improvement in rail safety sooner than anticipated. Canadian rail safety: underpinned by the smartphone? Here in the UK, three quarters of the population are digitally engaged, and approximately 200 million workers worldwide use smartphones and tablets for both work and personal use every day. This should act as inspiration to the Canadian rail industry, as they embark on their journey towards improved rail safety across operations and communities. As the UK rail industry has learned, in a relatively short space of time, there is no longer room for complacency where digital transformation is concerned. It is becoming a necessity, and as such, the importance of adopting and implementing a robust digital strategy – underpinned by the smartphone – should be a priority for the Canadian railways. By conducing and managing document-based processes digitally, via smartphones and their subsequent smartphone apps, not only can the Canadian rail industry begin accommodating the needs and safety of its workforce but facilitate a transformation in how commuters both use and experience the Canadian rail network. The planning of works delivery has been transformed by the implementation of our RailHub platform. By automating job assignments, workflow validation, sign offs, close call and incident reporting, as well as other vital railway documentation, our customers are not only able to operate entirely without paper on site, but able to work more productively, efficiently and safely. As such, our customers have seen a greater and more positive output from staff, and savings in the tens of thousands of pounds per month, as well as saving days per week in printing time. The Canadian rail industry is now on the precipice of digital transformation and taking inspiration from the UK railways is a good place to start. Investing in its digital future will not only sure that the Canadian rail industry’s workforce will become more technologically engaged – and thus safer both on the railways and work sites, the $20.7 million (CAD) available to the railways will be able to go further – ensuring that innovation is at the forefront of the transportation digital revolution across the Atlantic.